UTRECHT, Netherlands (AFP) — Veteran Fabian Cancellara (Trek Factory Racing) will have his work cut out if he is to begin his 10th Tour de France in yellow following Saturday’s 13.8-kilometer time trial. The 102nd edition of the Grand Boucle starts with a short race against the clock around Utrecht in the Netherlands. 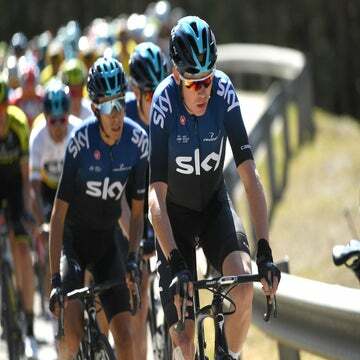 The “fantastic four” overall favorites of reigning champion Vincenzo Nibali (Astana), Giro d’Italia winner Alberto Contador (Tinkoff-Saxo), and the two men they succeeded, 2013 Tour winner Chris Froome (Sky) and 2014 Giro champ Nairo Quintana (Movistar), are unlikely to challenge for the victory on Saturday, although they will be looking to make time gains or limit losses against each other. Of the quartet, Froome is widely regarded as the strongest time trialist and Quintana the weakest, so the race will be on to see how much time Briton can put into the Colombian. But at the front of the race, Cancellara, 34, will be aiming to win an opening Tour stage or prologue for the sixth time, and don the famous yellow jersey for perhaps the last time. The Swiss rider known as “Spartacus” admitted this could be his last Tour. “I thought about this could be my last participation and last possibility to arrive in Paris, yes this is in my mind,” he said Thursday. Cancellara is probably not the favorite, though, despite his incredible time trial record, winning Olympic gold in 2008 and four world titles. German Tony Martin (Etixx-Quick-Step) has surpassed Cancellara in recent years as the king of the time trials, winning three straight world titles from 2011-2013 before he was beaten by current Olympic champion Bradley Wiggins last year. Martin rarely loses a time trial and has won three at the Tour since 2011 — missing out only in 2012 to Wiggins. Martin won time trials at the Volta ao Algarve and Tour de Romandie earlier this year and those were similarly short, at 19km and 17km respectively. But perhaps the smart money will be on Dutchman Tom Dumoulin (Giant-Alpecin), who is riding on home roads. He is a growing force in time trials and beat Cancellara in two races against the clock at the recent Tour de Suisse. He was third in the time trial world championships last year, 40 seconds behind Wiggins. And while he may not yet be able to beat Martin over a similar distance to that — it was a 47km course in Ponferrada — over the shorter distance and roared on by a partisan crowd, many feel Dumoulin could have the edge. The 24-year-old is looking forward to the challenge. “It will be really, really special and we saw last year in England when we started there it was absolutely incredible to have all the crowds there and I hope it will be the same or even better here,” he said. Other potential winners include Australia’s Rohan Dennis (BMC Racing) and Mathias Brandle (IAM Cycling) of Austria. Both briefly held the world hour record recently before Wiggins stretched that out to a mark that will be hard to match. Brandle managed to ride 51.852km in October last year but just over three months later, Dennis pushed it out to 52.491km, although that mark lasted less than three months before Britain’s Alex Dowsett (Movistar) added another 500m. Wiggins put 1.5km on top of that in June. In fact, Dowsett is another rider who could be in contention on Saturday, and all three could pull a surprise on the likes of Martin, Cancellara, and Dumoulin. As for Froome, Contador, Nibali, and Quintana, it will be a first chance to gain a psychological boost in the race for the yellow jersey, which will likely be decided in the high mountains in the final week. There will also be a few outsiders, including the likes of young French pair Romain Bardet (Ag2r La Mondiale) and Thibaut Pinot (FDJ), who will be eager to show they have the form to make a charge for a podium finish. And with temperatures expected to hit around 95 degrees, Saturday’s stage promises to be a scorcher.